When Jasper, a moderately sized bear well known to many Incline Village residents, was mistakenly shot and killed by a Washoe County Sheriff’s deputy in early May, the Tahoe community of bear advocates hastily organized a vigil. The strong attendance at the vigil and the depth of the collective grief for this bear demonstrate the passion that many people have for bears in the Tahoe area. But that passion has often led to conflict, as evidenced by a recent lawsuit filed in state court by a Nevada biologist against Bryant and her nonprofit, along with two other bear advocates who run social media sites related to bear issues in the greater Tahoe area. Carl Lackey, a longtime biologist with the Nevada Department of Wildlife (NDOW), filed suit in Nevada state court in Reno, alleging Bryant, her organization and two other bear advocates—Mark Smith and Carolyn Stark—made defamatory comments or at least allowed defamatory comments to be made against him on social media. “Carl Lackey, in the course and scope of performing his employment duties, has become the victim of continuing online and in-person threatening and harassing conduct from members of activist groups Bear League and the online forums Lake Tahoe Wall of Shame and NDoW Watch: Keeping Them Transparent,” Lackey’s attorney, Sean Rose, says in the complaint. The latter two organizations are run by Smith and Stark, respectively, and all three operations use social media in general and Facebook specifically as a significant instrument in their advocacy for bears. Specifically, the Bear League and NDoW Watch routinely post updates about where and why NDOW and Lackey place bear traps, when and how they shoot or euthanize so-called problem bears, and other aspects of the NDOW operation they find detrimental to the bear population at Tahoe. Lake Tahoe Wall of Shame is a Facebook page that concentrates on policing the trash bins and dumpsters of businesses and some private residences in town, displaying instances where trash is unsecured, which can attract bears to the urban interface. If a bear continues to hunt trash and damage property, it is either removed or killed. According to Lackey, the three sites have actively abetted a space where commenters are encouraged to say vicious things about him and his service, including false accusations of taking bribes, getting paid to kill bears and, in some extreme cases, publishing his personal information and threatening assassination. Bryant says she agrees with Lackey that such extreme behavior is despicable and claims her organization took down or hid such posts in a reasonable time frame. Bryant says she is “horrified” by the content of some postings, but noted her social media outlets are an important tool in keeping her members and followers informed. Bryant also insisted Lackey needs to toughen up, pointing out that she has also been the brunt of online abuse, which comes with the territory of being a public participant in a high-profile and contentious issue. “He’s gotta stand up a little taller and take his feelings off his sleeve a little bit,” Bryant says. Lackey’s lawyer did not return phone calls for this story and NDOW spokesman Chris Healy said the agency is not commenting on the suit. “That is Carl’s personal thing and we have no official stance,” Healy says. But Healy also says the agency is eager to shelve the stridency of a couple years ago when the conflict between the agency and bear advocates rose to a fever pitch—mostly related to the reinstatement of a bear hunt in Nevada. Bryant is also eager to put the friction in the past, noting that the agency hired a new biologist, Heather Rich, who attended Jasper’s vigil and has continued to make outreach efforts in the community. 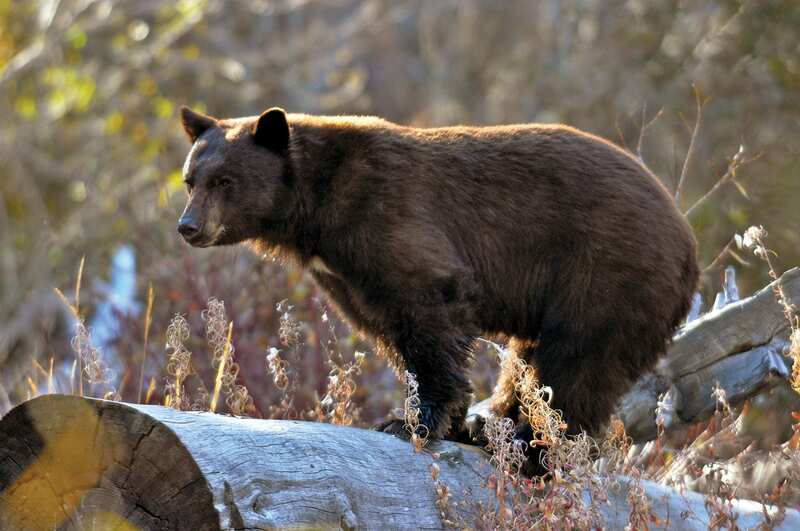 This doesn’t mean Lackey will quit coming to Incline Village, or that he will quit setting traps or even potentially euthanizing bears, Healy says. “Carl and I used to get along. It’s when the bear hunt controversy flared up that things went downhill between us,” Bryant says. Nevertheless, Bryant acknowledges Lackey’s scientific acumen and says she appreciates how he has worked tirelessly over his career to educate long-term residents and second homeowners about how to live responsibly in bear country. The pair also used to work in concert to place problem bears in sanctuaries or transplant them to more remote wildernesses, where the bears’ bad trash habits are less productive and thus less likely to get them killed. But with a defamation suit in state court and a lot of tender scars on both sides from the heat of recent battles, those days are over for now.